The reproductive patterns of four Antarctic gorgonian species have been investigated. Two of them, Dasystenella acanthina and Thouarella sp., present the bottle-brush-shape type; the other two, Fannyella rossii and Fannyella spinosa, are fan-shaped. Two different reproductive patterns have been observed in D. acanthina and Thouarella sp., which point to two size classes in the frequency distribution of oocytes. This feature indicates a reproduction cycle with overlapping generations, being each of them of more than one year, probably with seasonal spawning. F. rossii and F. spinosa show only one size class of oocytes, which could point towards an annual reproductive cycle. The presence of larvae in the gastrovascular cavities in both Fanyella species and Thoaurella sp. is a sign of a possible larvae release during austral summer. The number of oocytes per polyp ranges from 1.1 ± 0.10 SE to 1.5 ± 0.06 SE, and the size ranges from 50 to 1200 μm. The number of spermatic cysts ranges from 2.6 ± 0.19 SE to 5.0 ± 0.21SE, and their sizes range from 50 to 800 μm. These values are comparable to the reproductive trends and features found in gorgonians from other latitudes, which correspond in some cases with similar morphotypes. These coincident strategies could be related to morphological similarities rather than with latitude or water temperature. 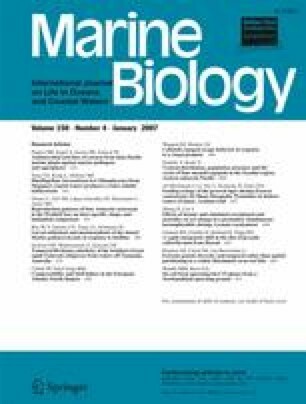 The results of this study indicate that octocoral morphology may play a crucial role in determining the reproductive output of these organisms. Financial support for this study was provided by a European Comission fellowship within the programme “Training and Mobility of Researchers” (TMR-CT97-2813), by CICYT (Spanisch Antarctic Research Programme) grants ANT98-1739-E and ANT099-1608-E, and by the programme “Acciones integradas hispano-alemanas” (314-Al-e-dr/ia. “Ministerio de Educación y Ciencia” and DAAD (Deutscher Akademischer Austauschdienst). We are indebted to Andrew Clarke, Miriam Fernández, and two anonymous referees whose comments improved very much the end version of the manuscript. We also thank Nuria Teixidó, Patricia Pinto, and Kerstin Beyer for their laboratory assistance. The authors are grateful to many colleagues who helped onboard, and especially to officers and crew of RV “Polarstern” for their cooperation and hospitality during the EASIZ II cruise.